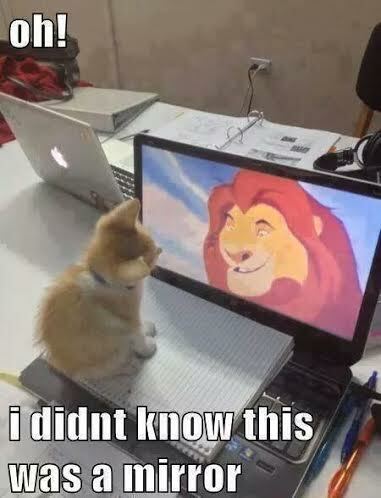 "Even a cat is a lion in her own lair." I wanted a soft look for my image and using my markers was just the thing....especially when I strayed a bit. Oops... So Janis can't stay in the lines???? No problema! I just made it look a little more "arty" than I had planned by shading the outsides of the lines with some of the markers, too. :) Now that looks soft!! I really love how the coloring turned out. My magic weapon was the ink blender. After I finished coloring the flowers, I made a circular pale spot with the blender pen in the middle of each "petal". (Technically these are called bracts on dogwood.....biology major, here! Ha.) I love the effect!! I did the same thing with the leaves. Automatic highlighting!!! Hey, I can do this!!! Wow! I die cut a lacy heart from Cheery Lyn Designs - Two of Hearts set. This is the larger of the two dies. I cut it from Add a Little Dazzle craft metal. I wanted silver, so I used the reverse of one of my other colors. :) Pretty, isn't it? I am playing just for fun over at this week's Add a Little Dazzle challenge...not for a prize....because I was the lucky winner last week!!!! I can't tell you how excited I am!!! My prize will be some more craft metal. Oh, yesssssssssss!!! So fun!! 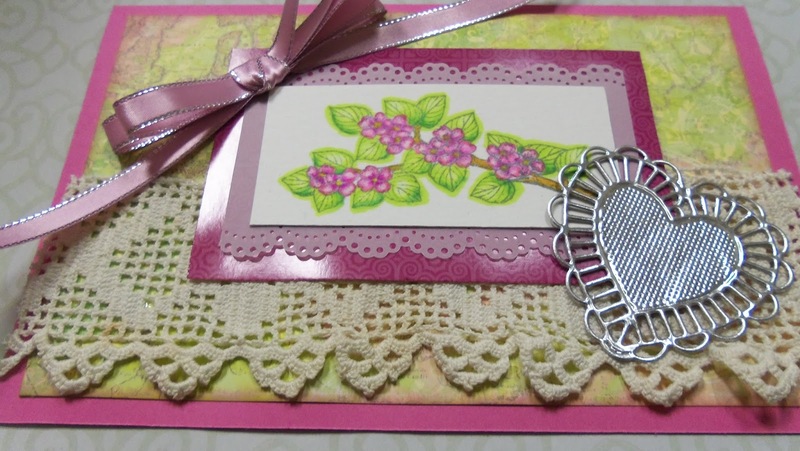 This card is also a thank you to Monica for her generous prizes and lovely products!!! THANKS!!!! Do you like that scrap of vintage lace I used??? It was a thrift store find. Yay!! It was just the right length for what I needed. I only trimmed a tiny smidgen off. Love that!! The vellum and the DCWV purple cardstock under the vellum were both scraps, too. Hooray!!! Other supplies I used were some pretty lilac ribbon with a silver thread running through it and some K&Co.background paper with Distress ink - Victorian Velvet inking. I hope you enjoyed my card!!! Ding, Ding, Ding..........New Follower Introduction Time!!! I have a brand-new follower to introduce today! A big welcome to the adorable Di of Pixie's Crafty Workshop!!! Di is from across the pond in the UK and runs the sweetest challenges where you get to use your scraps and snippets. She makes some very beautiful cards, too, that you won't want to miss. I hope each of you will join us over at her Pixie Snippets Playground!!! Di, thank you so much for becoming a follower!! As promised, here is a ginormous new follower smile just for you!!!! Thanks for joining us this week at MFP SF&F challenge. Thank you so much, Jane!!! I loved using the border punch on the vellum!!! Beautiful card, Janis. Love the lace and your coloring is beautiful! Thank you for sharing with us at MFP SF&F Challenge. Thanks, Vickie!!! I appreciate your kind words so much!!!! Thank you, Lis!! Copics are not hugely different from Spectrum Noirs, are they? (Except in price and prestige!) Seems like the techniques would be similar......but I might be very wrong there!! Wow!! 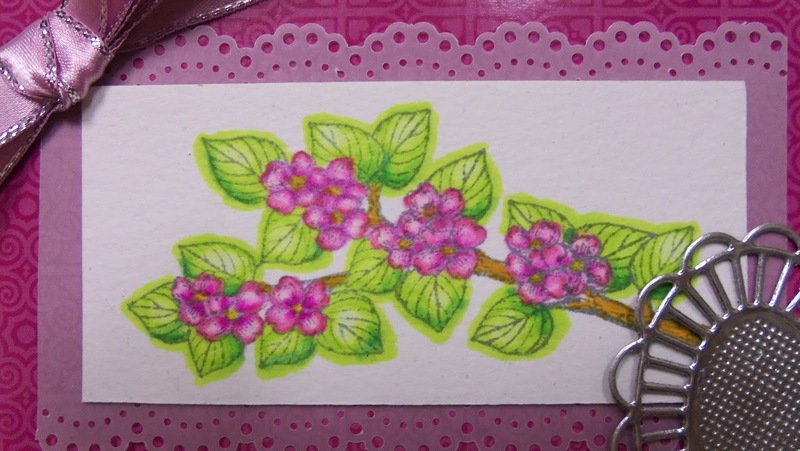 I saw this over on the Stampendous challenge and had to come over for a closer look. Perfect take on the Frilly and Fabulous challenge, with the vintage lace, the pretty border punch, and your beautiful coloring. I also have some Spectrum Noir markers that I don't use often enough but looks like I will have to get a blender pen as well because the effect that you got is just perfect. 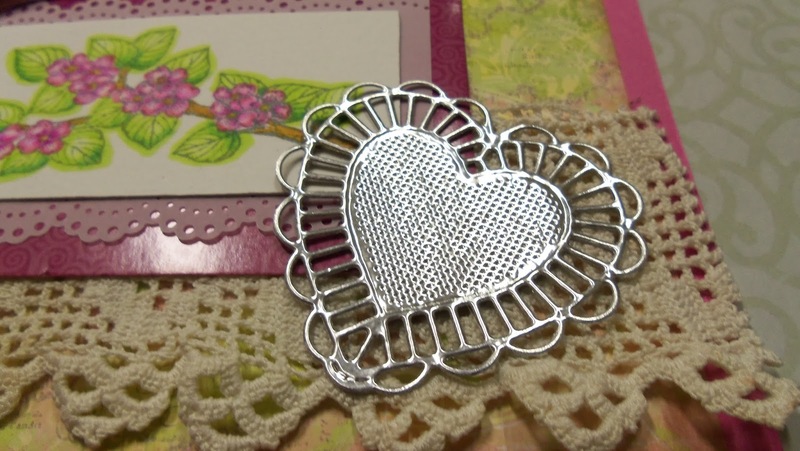 The silver die cut heart is a wonderful contrast to the fabric lace as well. Love this!! Thank you so much, Karen!! Sometimes it is really fun to make a fancy and frilly card! I would definitely recommend the ink blender pen. I don't know if SN sells theirs separately or not, but COPIC does. Also, the SN Essentials 6-pk has a blender in it. Using the blender makes me look like I kind of know what I am doing!! Now that is amazing!!! Ha. 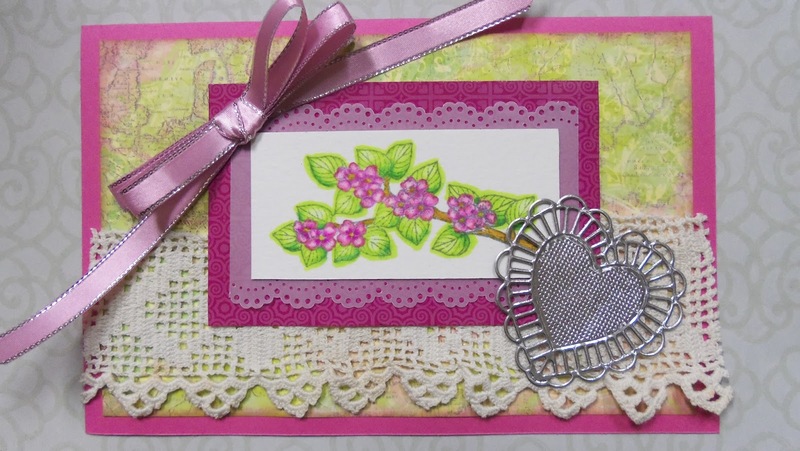 Love your card and if you only have one border punch that's the pattern to have - and your colouring is beautiful! Thank you, Di!!! Again, I really appreciate your support and encouragement by becoming a follower. Have a lovely week!! Very pretty. I like your coloring and congrats on your win! Thanks, Sue!!! You always have such nice things to say in your comments!!!! Hi Janis! So glad you are joining us again this week! This card is so pretty; love how you achieved your highlighting and the outside the lines coloring. Makes for a very pretty bract! :) That die cut heart in Add a Little Dazzle Metal is just gorgeous and is the perfect embellie for your image. Thanks so much for sharing at Add a Little Dazzle! Hehehehe....Thanks so much, Lee Ann, for your sweet words on my coloring and on the metal heart!!! Thank you so very, very much, Martha!! I love working with the craft metal. It makes every project just gorgeous!!! Beautiful card! Love that silver lacey heart! Thanks for playing along with our Vivacious Valentines challenge! Thank you, Julee, for stopping by. Your personal visit and sweet comment mean a lot to me!!! Very frilly and fabulous. Thank you for joining us at Dreaweaver Stencils.